Home Art Can you show Marisa how to use a door? My wife and I used to love The Good Wife and were sad when it finished, but pleased when the spin-off, The Good Fight, began. The creators may not get any awards for their clever series names, but the shows are great. 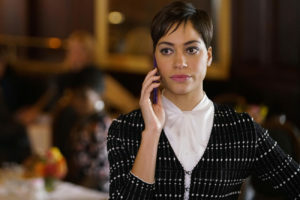 My wife and I just finished watching the Season 2 Finale, and if I wasn’t already in love with Lucca Quinn played by the amazing Cush Jumbo, I am now. The labor scene with all the swearing just broke me down. I fell in love with Lucca right then and there. Happy Wednesday everyone!